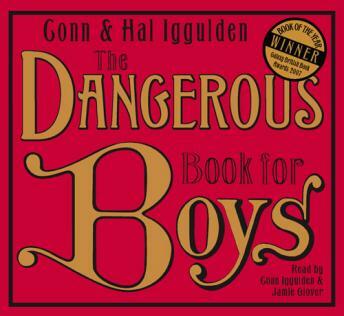 If ever there was an audiobook to make you switch off your television set, 'The Dangerous Book for Boys' is it. Packed with fascinating facts and tantalising trivia. Includes an introduction read by Conn Iggulden. Now available as a digital download. How many other books will help you identify cloud formations, list the seven wonders of the world, and recite the best quotations from Shakespeare? The Dangerous Book for Boys gives you facts and figures at your fingertips - find out the five poems every boy should know, learn about famous battles and read inspiring stories of incredible courage and bravery. There's a whole world out there: with this audiobook, anyone can get out and explore it. The Dangerous Book for Boys is written with the verve and passion that readers of Conn Iggulden's number one bestselling novels have come to expect. This book, his first non-fiction work, has been written with his brother as a celebration of the long summers of their youth and as a compendium of information so vital to men of all ages. Chapters in The Dangerous Book for Boys include: The Seven Ancient Wonders of the World, Famous Battles, Extraordinary Stories, A Brief History of Artillery, Sampling Shakespeare, Patron Saints of Britain, Five Poems Every Boy Should Know, The British Empire, Questions About the World, Latin Phrases Every Boy Should Know and The Origin of Words.